Situated at the entry point to Gippsland, Hogget Kitchen was established to pay tribute to the richness and quality of the produce found at its doorstep. It is the brainchild of Gippsland locals, chef Trevor Perkins and restaurant manager Jessica Martin (ex Silvereye, Momofuku Seiobo). 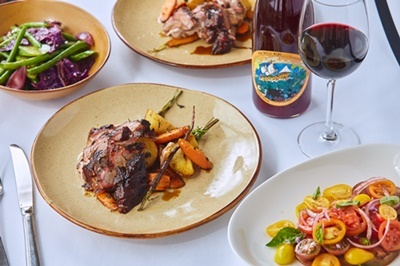 Their combined reverence for the land and producers shines through in every aspect of the restaurant – from the hyper-local ingredients to the sweeping views of the property’s vineyard and beyond through the glass walls of the dining room. At Hogget, Trevor embraces a nose-to-tail attitude, working with whole carcasses to celebrate every part of the animal. Everything is done in house to minimise waste and maximise flavour; from pickling and bottling to butchery, charcuterie, smoking and brining. The quality of the ingredients on each plate speaks for itself. Trevor is wise and skilful enough to apply only a deft hand to create such dishes as;​Gippsland White Dorper Lamb, chermoula, grains, jus; Glazed Brandy Creek Quail, potato salad, Quail Egg and ​Cavatelli pasta, Lakes Entrance Squid, crustacean sauce. ​ Sweetbreads and offal feature heavily on the menu whenever Trevor gets his hands on them including;​ Ox pluck terrine and liver pastrami ​ and​ Lambs brains with lamb bacon. Born and bred in Gippsland, Trevor’s roots run deep in the local community. He is known to farmers for his regular visits to their properties and understands firsthand how generous the area’s rich volcanic soil can be. 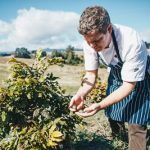 Hogget’s menu reads like a love letter to Gippsland, rejoicing in the local abundance from producers like Butterfly Factory micro dairy, Alpine Trout Farm, Baw Baw Food Hub, Tennessee Tasty and even from his own mother’s garden. Located on the former Wild Dog Winery, Hogget Kitchen was the result of a partnership between popular Victorian winemakers Patrick Sullivan and William Downie, who lease the surrounding vineyard. Hogget’s wine list dedicates a page each to Patrick and William’s wines, showcasing back vintage releases and an array of drops from their leased (and home) vineyards situated close by. Hogget is about to release its own wine, aptly dubbed ‘Nose to Tail’. It will be available to purchase directly from the restaurant and sits on the Hogget Kitchen wine list alongside a considered selection of natural wines, organic farmed wines and wines from boutique producers. Hogget Kitchen serves as a true ambassador for Gippsland’s incredible community, produce, and the humble good food that best shows it off. From Wednesday to Friday the restaurant serves an a la carte menu, with a set menu available on weekends. Alternatively they have a ‘Let Trev Cook For You’ menu for $70pp.